A nice pic of my 3 panel NLC at NM#18. note the power distro boards with space for Euro connectors.......Dan! Also has more Korg 800dv ext input PCBs, dual VCA/panners, Envelope followers/LFOs and Vox filters/LFOs. 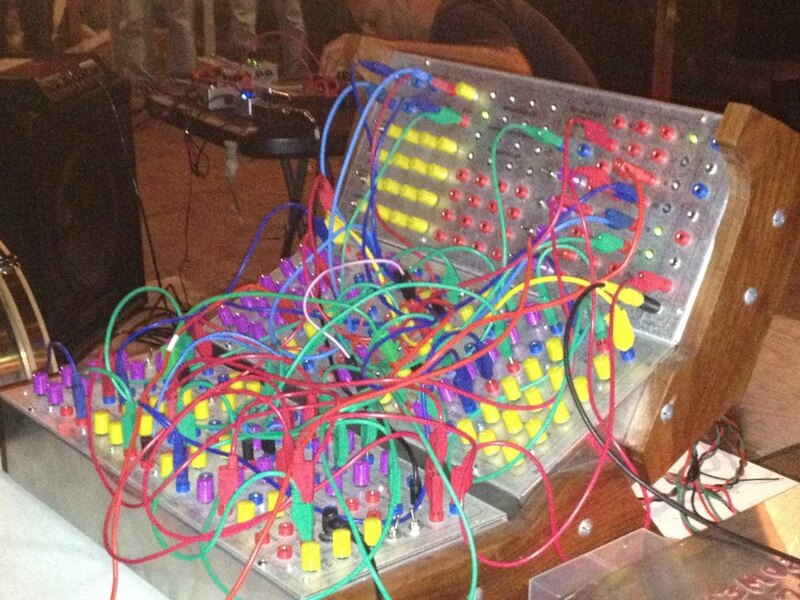 I like LFOs. 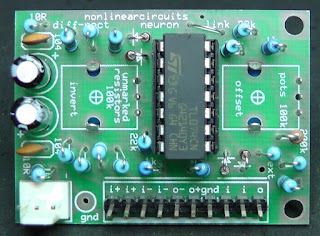 This board contains 4 LFOs, with individual and summed outputs. Plus a set of four parallel fixed and variable bandpass filters with VC Q and a VC notch filter to form a vocal effects animator. This was inpired by the Vocal Effects Waveform Animator in Electronotes, but has been changed to give more functions, use available smd ICs and to make it ridiculously complex. Each of the variable filters has an individual output, the filters are also summed and passed thru a notch filter to get the vocal effects. 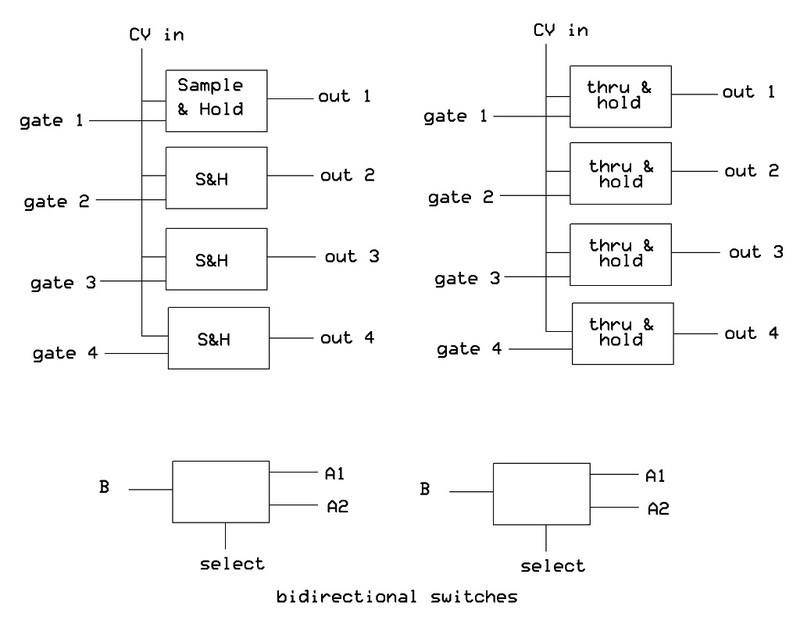 The summed LFO outputs are all different, each draws the outputs of three of the four LFOs, so summed outs consist of signals from LFOs 123, 234, 341 & 124. There is a spare OTA stage which I may implement as a VCA, but not sure if I can be bothered at this point. This design has taken nearly 3 months to complete. It will take up 6 columns on a NLC panel, thankfully no wiring to do. 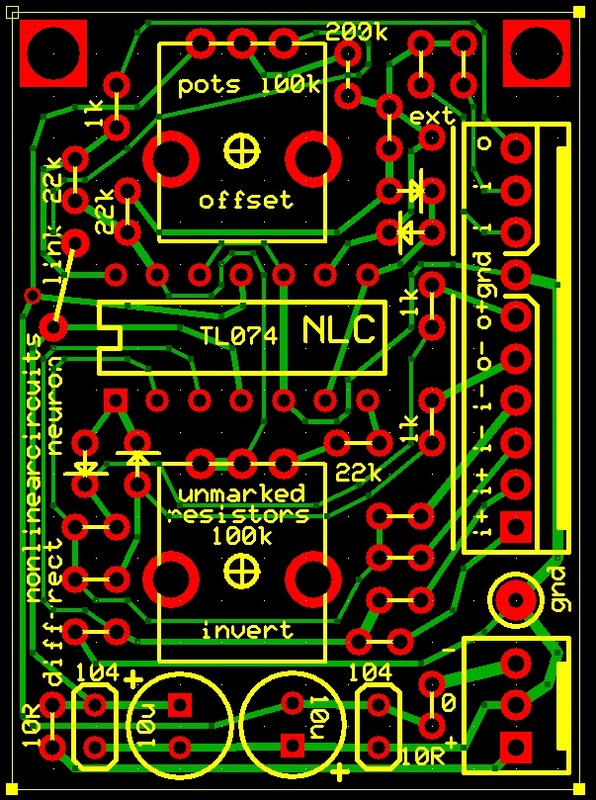 I keep getting asked about these so have sent off a design for a pcb containing 1 of each of these circuits. The Difference Rectifier has 4 inputs (two + & two -) and two outputs. The Neuron has two inputs and one output. There is a pad labelled 'ext' where extra inputs can be added if desired (use a 100k resistor attached to the jack). All inputs for both circuits can be wired to attenuating pots if required. 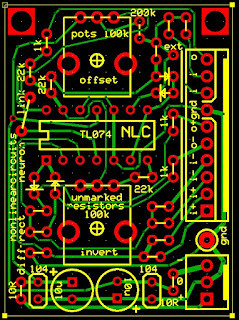 The two pots on the PCB are the critical Offset and Invert controls for the Neuron. The Offset is slightly modded from the previous Double Neuron PCB as it now ranges between +V and -V and its effect is halved by the 200k resistor to give greater useful range. The PCB is small so will suit Euro builders. Approx 1.5 by 2 inches. 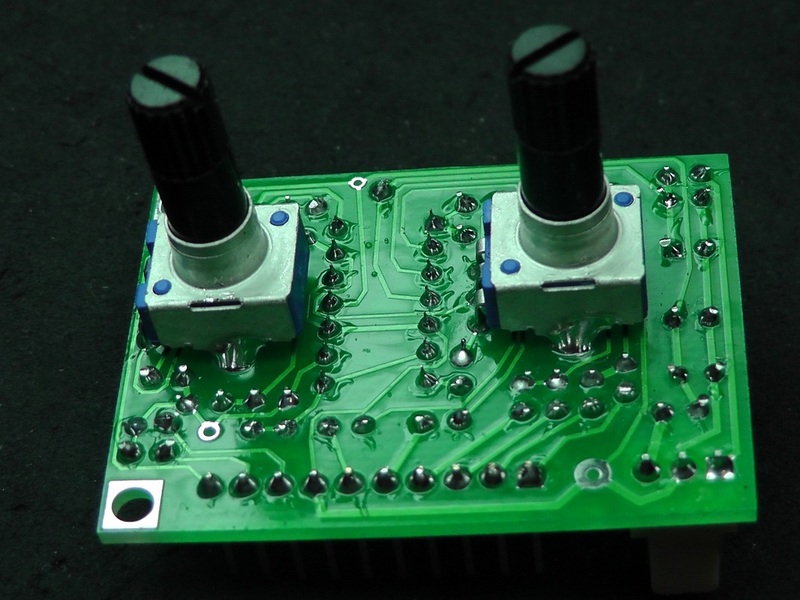 The 2 board mounted pots (both 100k) are 1 inch apart, the idea is to mount the PCB to the panel with threaded pots. There are 2 mounting holes otherwise if you want to attach the board some other way. 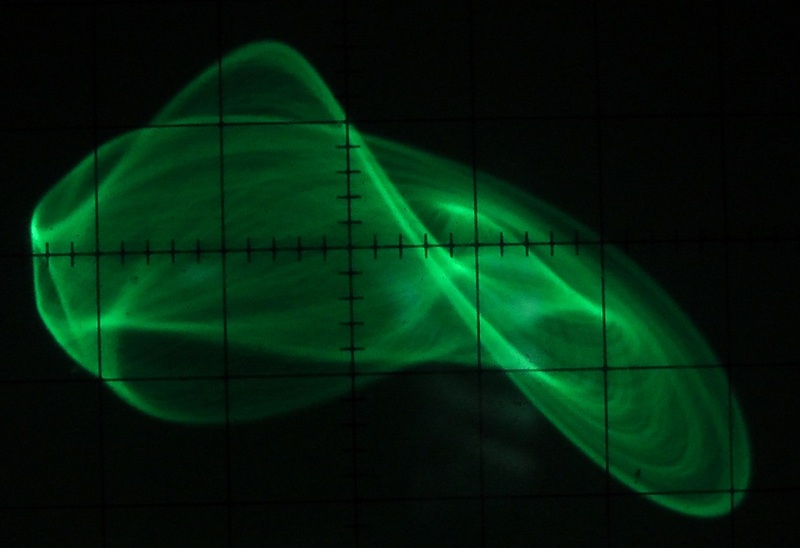 Playing around with a new type of chaos circuit. It is an extension of the Muthuswamy/Chua 3 component chaos circuit (which has just an inductor, capacitor and a memristor). In this one I developed a circuit to mimic a complex memristive system. Whether it makes it into a synth module or not is uncertain, it needs five AD633s at $8 each. For now it is just some good pictures. A utility PCB, no pots, just jacks. Moog fixed filters - brass, vibes, humana, funk, harpsichord another fixed parallel BP voice filter (called gargle). These can of course be used with any audio or noise source but are intended primarily as filters for the extra outputs on the Veena. Also has white noise, pink noise, random vibrato, slow random, chunder (roar), two difference rectifiers and a 4046 phase locked loop circuit. Somewhat pleased to find everything worked very nicely. I tweaked a couple of resistor values to get the white noise level off the rails and get the LED brighter and flashing more often. Otherwise it is fine. One nice feature is to daisy chain the filters to get new sounds. 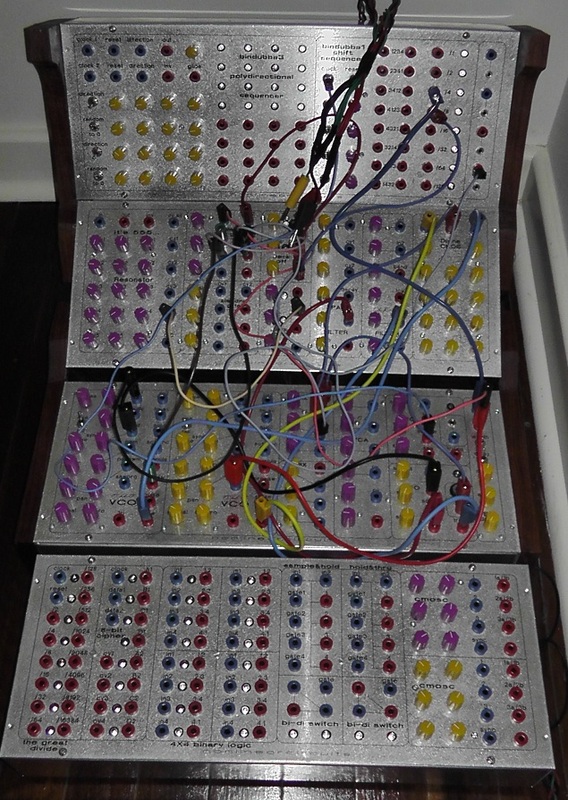 The 4046 PLL was a bit of a gamble but it sounds great, adds a bit of distortion and spits, screams and fizzes as it tries to track the incoming signal. I built the proto-type with nearly all ceramic caps, figuring that will be the worst it can sound, but it actually sounds good. the original Moog passive filters, that these are based on, were likely built with ceramics anyway. 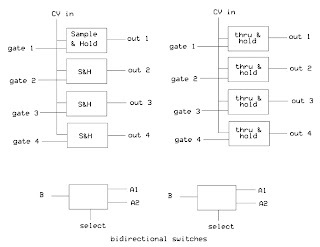 "Bleeding Gates" VC Slew: double module each has three individual channels giving 6 in all. 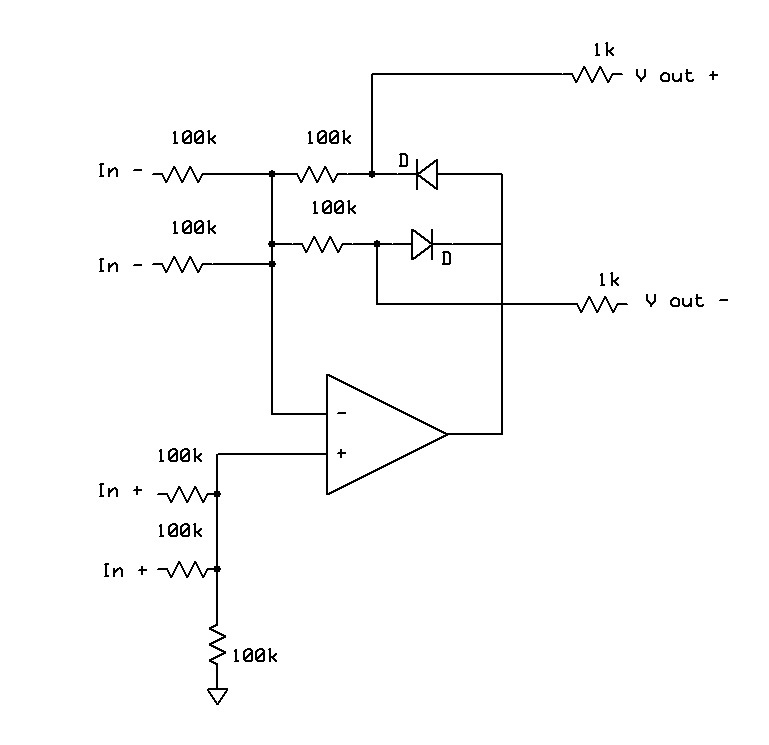 VCF - filter based on Arp and Electronotes designs. is HERE! (click to get 820kb pdf) Just a draft, would welcome any feedback on how to improve it. 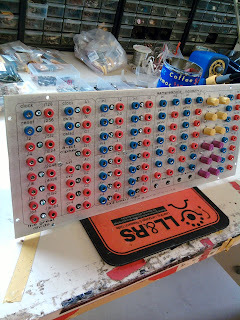 Ready to be shipped, these cost US$1200 btw, 6 left Contains Great Divide, 8 bit Cipher, 4X4 Logic, 4 stage sample & hold, 4 stage thru & hold, 2 Bi-directional switches, CMOSC - 12 oscillator drone module. The user manual can be found HERE. blurb (from http://www.sdiy.org/pinky/data/arseq.html) - This circuit is quite simple but an excellent envelope generator. It has a counter, four attack release generators (ARgen) and a mixer. 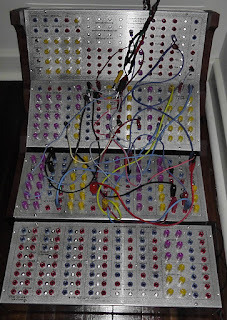 but it only took an extra pot and two diodes on each stage to turn it into what it is now. The ARgen circuit is pretty common, I have seen at least 6 variations of the circuit around the net. Most likely it evolved from the old diode function generators of analogue computer days. Each stage takes two clock signals, the 1st starts the attack slope. If the slope is steep enough the output will reach the sustain value set by the level pot for that stage. The next clock signal puts that stage into release mode and the output starts to drop. the signals from each stage will sum in the output mixer. indicating the output signal is a mix of two or maybe more stages. kind of a utility PCB, no pots, just jacks. this circuit is very simple, just one op amp stage, but when fed 2-4 CV signals it produces a wonderful array of complex envelopes. In the vid, the blue and yellow traces are the inputs, the pink one is the output. It starts off fast but slows down after a minute, so it is easier to see what the cct is doing. This module has 10 circuits: 4 thru&hold, 4 sample&hold and two bidirectional switches. The thru&H and S&H all work off the same CV signals (or noise or whatever else applied to the input) but each stage is independently gate controlled. The bidirectional switches are, of course, inspired by the early Serge modules of the same name and have the same functionality. Either feed an input signal and use a gate to choose whether the input goes to output A or B, or feed two input signals into A and B, then use a gate to decide which gets fed to the output. This design differs from the Serge (which uses 4007 CMOS) as it uses DG411 analogue switches and can pass any signal between +/-12V. It can also operate at audio frequencies so some fun can be had using 3 audio signals to switch between each other. 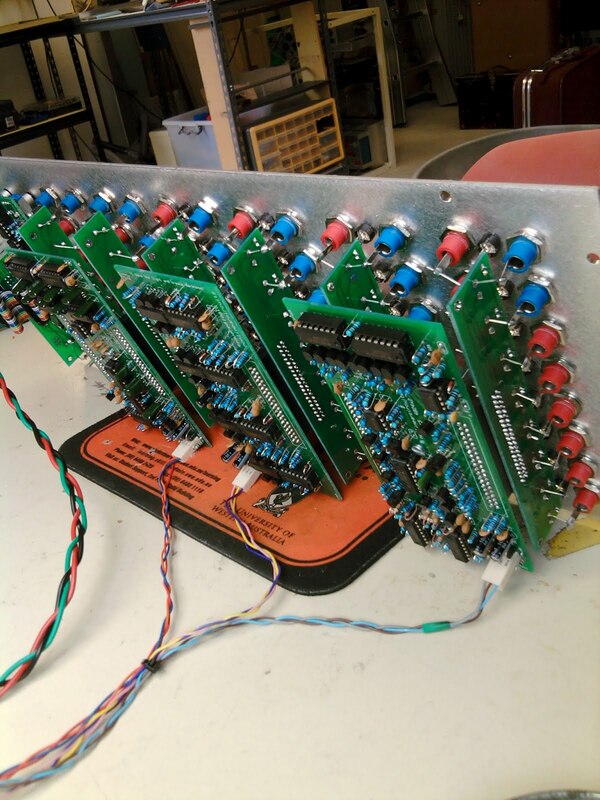 These PCBs are for Korg 800dv synths. Each has two CV channels and two gate channels, based on the schematics from e-lab. You only need one.